For Simplecast hosted sites. Once your podcast has been accepted and shows up in the Apple Podcast Directory, it's recommended to have your Simplecast Audio Players and Simplecast Site show an Apple Podcasts badge and link your new listing. To do so, simply navigate to your podcast's profile page in Apple Podcasts, click on the arrow next to the Subscribe button, and click Copy Link (example screenshot below). 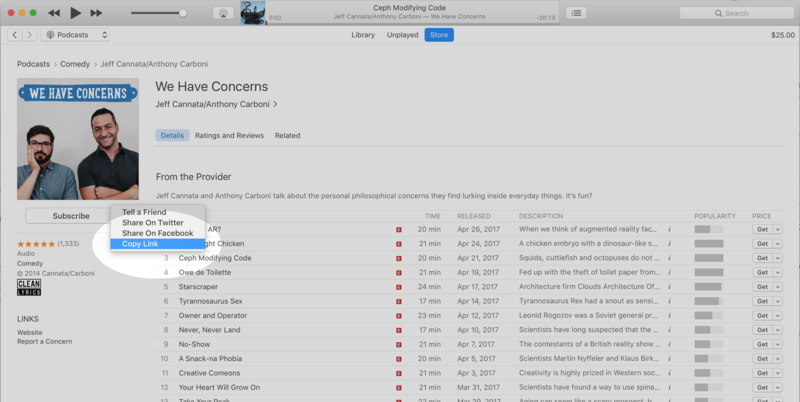 With this URL on your clipboard, edit your podcast's Website Settings on Simplecast and paste this URL into the iTunes Store URL field. Save the changes.